Liverpool are looking to offload two Nigerian starlets in the summer, according to reports. Goal.com's Neil Jones says Taiwo Awoniyi and Sheyi Ojo are among the five loanees that could leave on a permanent basis when the transfer window reopens, with Liverpool already having received enquiries. 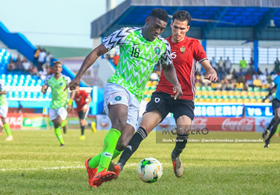 While Awoniyi is spending the second half of the season at Royal Excel Mouscron, Ojo was loaned out to French club Reims in August 2018. The two attack-minded players extended their contracts with The Reds before they were shipped out on loan. The Nigeria U23 international has been linked with possible moves to clubs in Germany and Belgium in the summer. As for Ojo, he has struggled to break into the first team of Reims, with his last appearance coming against Toulouse on January 22, but he is still highly regarded by English clubs. The England U21 international has played 13 games in total for Liverpool's first team while Awoniyi has yet to debut due to work permit issues.